Bidzina Ivanishvili. Photo CC BY-SA 3.0: The Polish Senate / Wikipedia. Some rights reserved.When Bidzina Ivanishvili, Georgia’s richest man, first came to power, he promised to leave it as soon as possible. For many years, the billionaire, who made his money in Russia, was involved in charity at home. He paid the wages of Georgia’s intelligentsia. He built roads and churches. He financed the most successful, in his words, police reform in Georgia in recent history. And he did all this without the Georgian public ever knowing what he looked like. In 2011, when Ivanishvili declared his decision to put an end to the rule of president Mikheil Saakashvili, Georgian journalists found it hard to find his photograph in their archives. Perhaps this anonymity contributed to a perception of Ivanishvili’s emergence as a sign from above – at least by a part of Georgian society who were tired of the social and economic problems they had faced under Saakashvili. In 2013, Ivanishvili handed his post of prime minister to a successor before returning to a reclusive life in his home village. He concentrated on his interest in ancient trees, which he began buying up all over western Georgia to plant in his arboretum on the Black Sea. Indeed, this is how the transport of giant trees from one part of the country to another became a new genre of Georgian politics. The opposition has, on several occasions, published documents that explained how the logistics behind Ivanishvili’s new hobby has been paid for out of state funds. The authorities, however, continue to refute these accusations. Before departing his post, Ivanishvili told the public the only reason he’d return to Georgian politics, comparing this scenario to the “Second Coming”: “This will only happen if Georgia will be gripped by some kind of disaster.” But though Ivanishvili has now become chairman of the ruling Georgian Dream party, he’s yet to make any official statements. Instead, against the background of a new scandal, it has fallen to the leaders of Georgian Dream, which Ivanishvili originally founded, to explain Ivanishvili’s return. It was Georgian Dream member Gedevan Popkhadze who started it. Angry at the election of journalist Niniya Kakabadze to the advisory board of Georgian Public Broadcaster, the MP promised to leave the parliamentary majority and ruling party. Popkhadze accused his party colleagues of supporting a person who had insulted Catholicos-Patriarch of All Georgia Ilya the Second. “To make a decision like this on Passion Week is like spitting on the soul of all Orthodox believers,” Popkhadze said in early April. Here, Popkhadze was referring to the fact that in 2016 Niniya Kakabadze made a reference on social media to visiting the Patriarch’s home when she was a child. “A soulless bourgeois,” this is what Kakabadze called Ilya the Second, much to the consternation of part of the Georgian public. 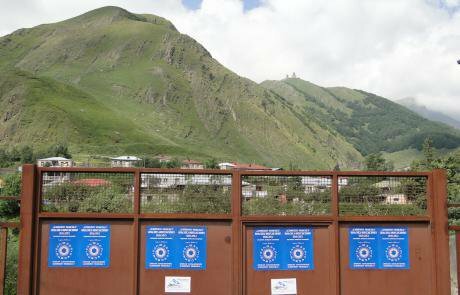 Election posters of the "Georgian Dream" party in the village of Kazbegi, 2012. Photo CC-by-2.0: Maxence / Flickr. Some rights reserved.Popkhadze’s departure has caused further arguments within the ruling party, which has, for the first time, separated into two camps – while one group condemned Popkhadze for his attitude to fellow party members, others expressed their solidarity with him. For example, Irakly Kobakhidze, speaker of the Georgian parliament, said that Popkhadze was manipulating society’s religious feeling – though Kobakhidze also said that this would be the end of the story. This, however, didn’t scare Popkhadze or his allies, who then began talking about trying to change the speaker in parliament. This open conflict has divided Georgian Dream into what analysts call two teams – one allied to Kobakhidze, and another allied to the current prime minister Georgy Kvirikashvili. Indeed, Kvirikashvili has been the chairman of Georgian Dream prior to Ivanishvili’s return. Ivanishvili’s return was preceded by Freedom House’s new report on Georgia, which states that the ex-prime minister was significantly influencing political life, despite the fact he didn’t hold any offices in government. “One of the most active non-governmental sectors, a completely different level of media freedom, an excellent situation with human rights,” this is how Kvirikashvili reported on Georgia’s progress since 2012, calling Freedom House’s assessments non-objective and recommending FH researchers to “have a serious think”. The fact that intensifying international criticism and accusations of pulling strings from behind the scenes had brought Ivanishvili into the open was noted by Georgian analysts. But there’s no clear answer why Ivanishvili has returned now, a few months before the presidential elections. After all, the opposition has made these kind of criticisms since Ivanishvili resigned as prime minister. This autumn, Georgia will elect a president for the final time – constitutional amendments mean that, in the future, presidents will be appointed. Ivanishvili himself supported the current president Georgy Margvelashvili, but Margvelashvili, it seems, didn’t deserve this trust, instantly distancing himself from Ivanishvili. After his political collapse in Ukraine, Mikheil Saakashvili, Ivanishvili’s principle opponent, has begun more actively participating in Georgian political life. Though Saakashvili was beaten by the billionaire, Georgia’s ex-president (who is wanted on criminal charges in his home country) continues to criticise the government on air at the opposition TV channel Rustavi-2. And although the majority of people have had enough of Saakashvili’s style of rule after nine years of it, it’s obvious that Ivanishvili is annoyed by his criticism. After all, it was the conflict with Saakashvili in 2012 that forced Ivanishvili to leave his comfort zone and become involved in public life (which, according to his admission, he hates). Perhaps Ivanishvili couldn’t find a leader in his movement capable of resisting Saakashvili. In the past six years, few leaders have emerged in the country – the battle for power is still being waged by the same old faces. But how relevant is Georgia’s ex-president for the average voter? Given the socio-economic problems most people face on a daily basis, the priority is no longer demolishing power structures, unlike 2012. Back then, many people associated the name Ivanishvili with prosperity. Instead, perhaps the time has come when Georgians will have to vote for concrete things that they want to see from their government, rather than a “messiah” or “charismatic leader” as usual.